Lily has squeezed herself into undersized relationships all her life, hoping one might grow as large as those found in the Jane Austen novels she loves. But lately her world is running out of places for her to fit. So when her bookish friend invites her to spend the summer at a Jane Austen literary festival in England, she jumps at the chance to reinvent herself. There, among the rich, promising world of Mansfield Park reenactments, Lily finds people whose longing to live in a novel equals her own. But real-life problems have a way of following you wherever you go, and Lily's accompany her to England. Unless she can change her ways, she could face the fate of so many of Miss Austen's characters, destined to repeat the same mistakes over and over again. 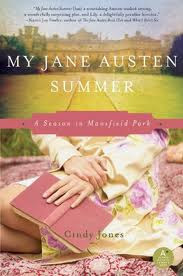 My Jane Austen Summer was a unique tale full of…well, Jane Austen and even managed to contain a paranormal aspect. A story of moving on and growth, this novel was slow to start for me as I found the main character, Lily, slightly over-depressive at first, but eventually I grew eager to find out her fate. Lily Berry moves half way across the world to escape her crumbling life. She lost her job, her boyfriend just dumped her, calling her needy along the way, and she is still grieving her mother’s death while her father has already moved on. Lily always finds solace in Jane Austen’s works and when the opportunity arises for her to join a Jane Austen festival as an actor in England, she doesn’t flinch or waste a second making the arrangements, even though she she’s barely acted in her life, nor can she afford the trip. I am not a huge Jane Austen fan and look forward to hearing what Kathryn thinks of this one because she’s much more interested than I am. This, however, did not hinder my enjoyment of the story too much and I grew eager to find out Lily’s fate and enjoyed watching her find herself and begin to change her life in direction she wants it to take. It did take a while to warm to Lily’s character and it probably wasn’t until I was halfway through that I started to have much more interest in her as opposed to the unique characters she meets along the way. At times I wanted to shake her, especially when it came to her roommate, but she gradually changes her ways in time. The ending wasn’t typical and not exactly what I expected, but I enjoyed it none the less. Not entirely predictable, I liked how Lily grew in her role at the institute, her self discovery and growth and enjoyed her little shadow’s antics. I wasn’t sure exactly whether all her issues were resolved, but I think that’s the fairy tale ending I’m usually looking for and this one’s right on the money for real life. Not everything ends up picture perfect in My Jane Austen Summer, but is a work in progress, which is exactly what we see here. I look forward to reading more from Cindy Jones! Thank you to HarperCollins Canada for our review copy! All opinions are our own.